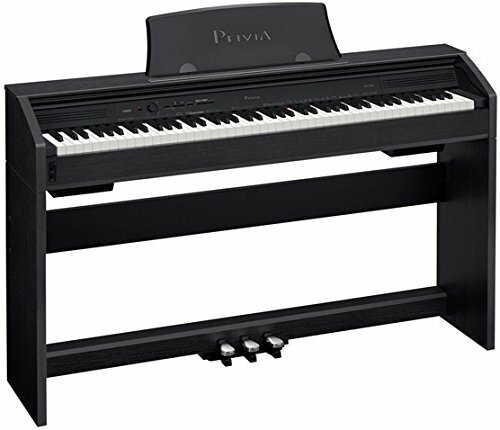 The Casio PX760 Privia Digital Piano is an improved version of the previous model – the Casio PX750. Not only does it have all features of its predecessor but also other massive additions. What are its additional features? In particular, there are classical music and smooth sound in songs library. It is important that the precision is higher. Therefore, if compared to the past version, the Casio PX 760 is more impressive. We will start reading the Casio PX 760 review below to learn all the features related. Is The Casio PX 760 Good Enough ? As previously stated, the keyboard of the Casio PX760 utilizes the keyboard system of the Tri-sensor Scale Hammer action. With this system, you get hammer replicated keys. They are similar to an acoustic piano that has the lower keys with heavier weight and the high keys with lighter weight. When playing, the keyboard brings an ivory and ebony feel. This helps to hold your fingers and prevents them from slipping. It is worth noting 3 sensors on the touch response function of the key. They measure the hammer speed against the velocity of the pressed key. The result is to create an excellent pair for the quality sound and then the performance becomes more detailed and exquisite. It is no coincidence that the Casio PX760 provides details and resonance. One section is due to AIR Sound Sample. Plus, the 128 polyphony provides stability to the players. Make the sound smoother than the previous model. Yes, it is very smooth and also easy to control responsiveness. If desired to play the Casio PX760 at home, it is okay. With the 8x8 speaker (16 watts), you will get a sufficient sound. Another outstanding point is Concert Play function – a special feature that the Casio PX760 Privia Series upgraded. Not only does this function include 10 songs with the high-quality audio data but also allows performers to listen to what they are performing. That said, we have to mention piano sounds such as bright, concert, mellow, classic, and modern. Coming with that, the Casio Privia PX760 are 5 different sounds, which service the self-amusement. Furthermore, there are the organ, string, E-Piano, and 13 various sounds to support instrument studies. What a good it is! The Casio Privia PX760 makes impression on the players with 88-key Weighted Graded Hammer Action. Apart from the same size and action similar to an acoustic, the lower keys are heavier and vice versa. To prevent your fingers from slipping, this piano builds in an ivory key. Both bring a prestigious look and create a cleaner feeling. It is noticed that there are three sensors on the key. You can feel in detailed when controlling the strength. Plus, another option helps to control the responsiveness and velocity. Personally, we appreciate that the Casio PX760 has better touch than other pianos in the price range. The Casio PX760 has a variety of functions. Lesson function: Include 60 demo songs for practicing each hand before you start playing with two hands simultaneously. Split: Allow playing two different instrument sounds on every hand. If your left-hand plays vibratone, your right-hand might play the piano. This offers the effect: one person is playing two instrument sounds. Layer: You may play 2 different sounds on one key with this technique. For example, you can play “piano and organ” sound concurrent. From there, your performance becomes more enjoyable and beautiful. Duet Mode: The keyboard is divided into 2 separate keyboards, but their chromatic scale is the same. You are like playing 2 different pianos. This function suits both the performance and a lesson (a teacher and a student). Transpose: It allows you to harmonize with a variety of instruments. Touch responsiveness control: You are easy to control the touch responsiveness strength. Others: Aside from the functions listed above, the Casio PX760 also has other functions such as a metronome, USB function, and recording. With the USB function, you can connect it to your computer for computer music enjoying. As previously stated, the Casio PX760 provides the USB connectivity that allows connecting the external appliances. If you want to transfer files or recordings from the digital to your computer, you can connect with your Mac or Windows computer. We especially love this because not having to install or download drivers on the computer. In addition to that, you could record or playback any performances on your piano through a 2-track MIDI recorder. It is noticeable that you can separately playback the left-and-right-hand playback performance and then find out what your hand is better. The models from the Casio Privia always provide the best warranty to consumers. In particular, the manufacturer will take the place of the item if the product has a defect. They also provide 1 year and 2 years in warranty after registration. Totally, you get a 3-year full warranty when using the Casio PX760. 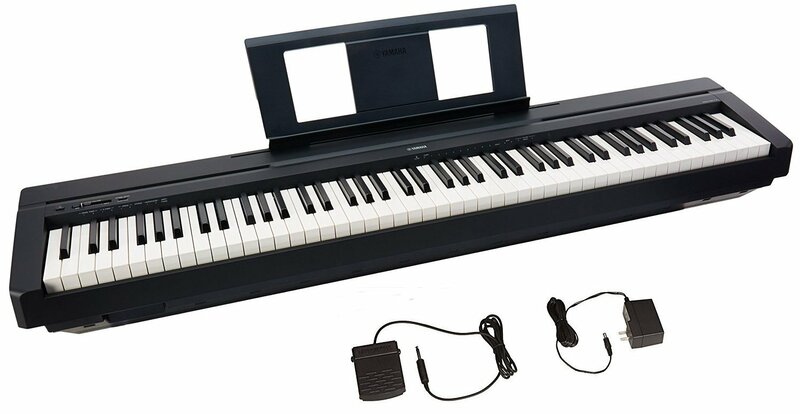 The expressive timbre of the Casio PX760 provides players with a selection of sounds closed to an acoustic instrument. The integrated triple pedal combining with damper resonance both supports the focus on the natural piano sounds and produces fine sound quality. It offers great sound at full volume. It does not take up more of your living space, so it is ideal for an apartment. The Tri-Sensor Scaled Hammer Action Keyboard and Multi-Dimensional Sound Source ensure a truly stunning piano experience. 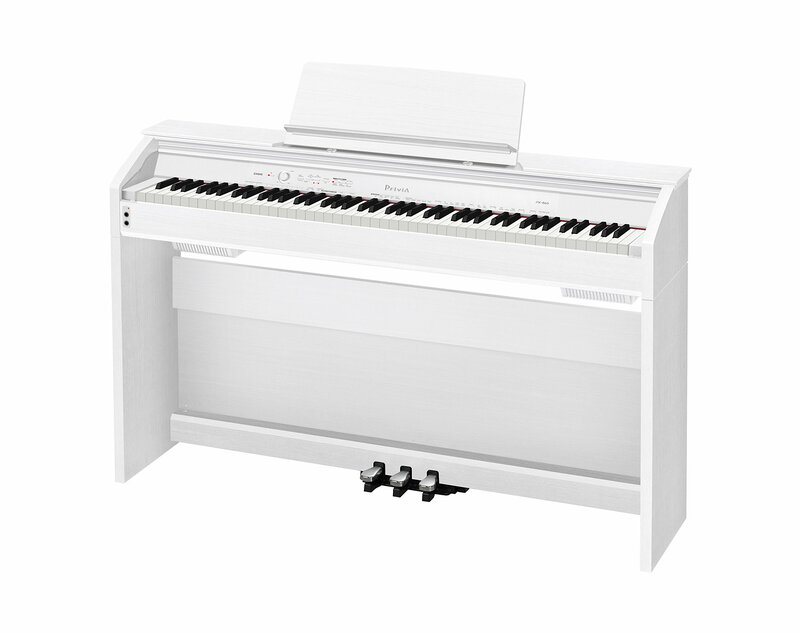 The integrated stand, three-pedal system, quality cabinet, and keyboard cover makes the Casio PX760 look nice in any room. Don’t have the good connection between the wire and the pedal unit to the bottom of the keyboard into the design. The keys are a bit heavier than a real piano, so it makes playing fast movements hard. To help you get a better view of the Casio PX760, we compared it to the same models. Being the same brand and product line, the Casio PX760 and PX780 has similarities. Both have a similar cabinet construction. They are optimal for a narrow area, an apartment or a bedroom, for example. With that being said, three pedals are the common feature that the PX780 held from the PX760. So, do they have any difference? No! No! The PX780 has upgraded the sound clearly. It built-in dual 20w speakers that are better than the speaker system of the PX760. Moreover, 250 unique tones built-in the PX780 are more prominent numbers than the 128-polyphony number that the PX760 provided. That’s why the PX780 is more expensive than PX760. View from different angles, the differences are no more, but the PX780 is highly appreciated unless you take the price into consideration. 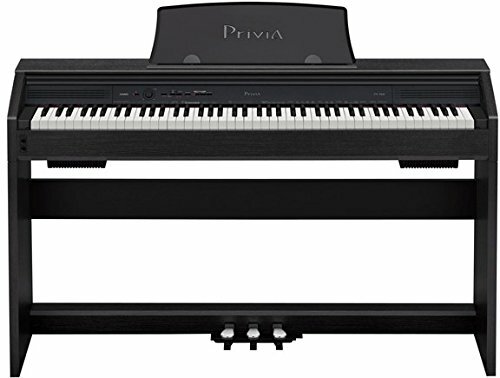 The Casio Privia product line often has the slim design that we called in lifestyle type pianos. Both the Casio PX760 and PX860 are the same brand and Privia line. They are good for where you need a piano in a small space such as an apartment or a child’s bedroom. They also look very similar in terms of the cabinet design. Another similar feature is pedals. Both have three pedals – the sustain pedal, loud pedal, and a sostenuto pedal. Both of them allow you to record two tracks, your right-hand and left-hand independently. We have noticed actually is that, however, the back of the PX760 is actually open. You can see the cables and main sockets behind. On the contrary, with the PX860, you can see the back is filled in, so it looks a little bit neater. Beyond that, the speaker system in the PX860 is quite a bit more powerful than the one in the PX760. And even at lower volume, the PX860 does seem to have a sort of warmer because the speaker themselves are actually larger. As a result, there is nicer quality sound coming from the PX860 though the PX760 and PX860 got the same set of sound – 18 different sound built into them. 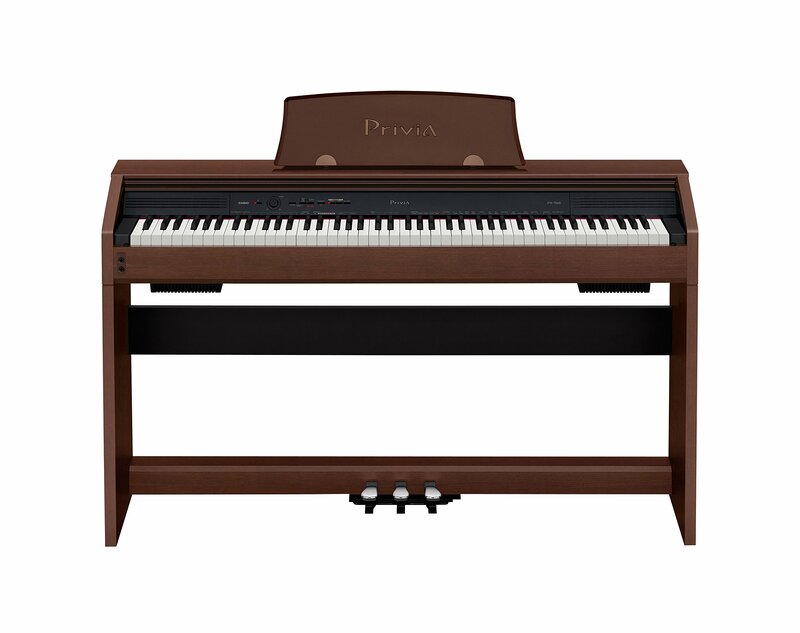 If you have on a very tight budget and you just need an entry-level piano for your child who is learning, the PX760 is perfect for that. We do not mention the look of the Casio PX760 and Yamaha P45 because you can clearly see the differences between both. We will show the different features of both instead. Both the PX760 and the P45 build-in the pedal, but the PX760 is a winner when providing up to 3 pedals. 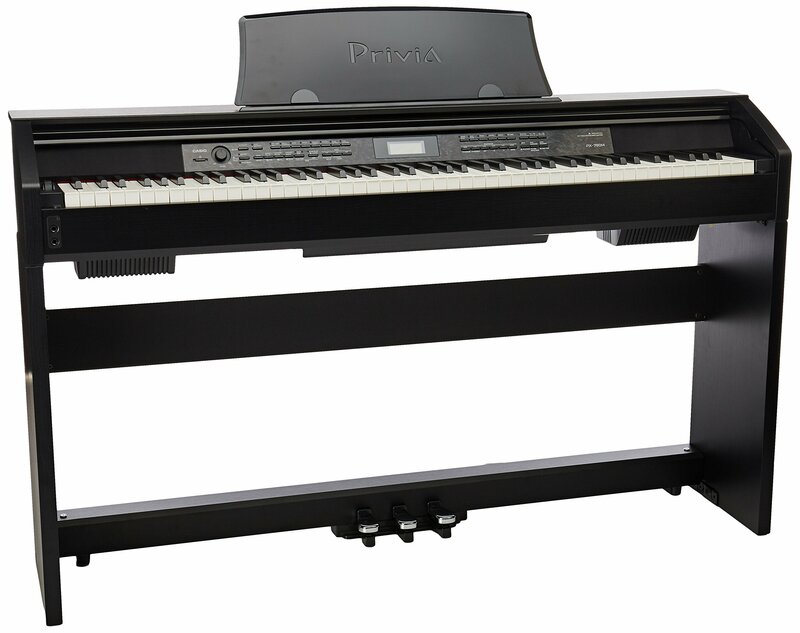 Being the 88 fully weighted piano-style keys, either the PX760 or P45 ensures a piano experience. Nonetheless, the Tri-Sensor Scaled Hammer Action Keyboard is more optimal when it is truly stunning. If the P45 contains 64-note polyphony to play moderately dense piano passages, the PX760 also has 10 orchestral pieces for piano, along with 128-note polyphony. The PX760 has doubled the number of the P45’s note polyphony. Honestly, the PX760 and P45 have the obvious differences although both are a good option for beginners. 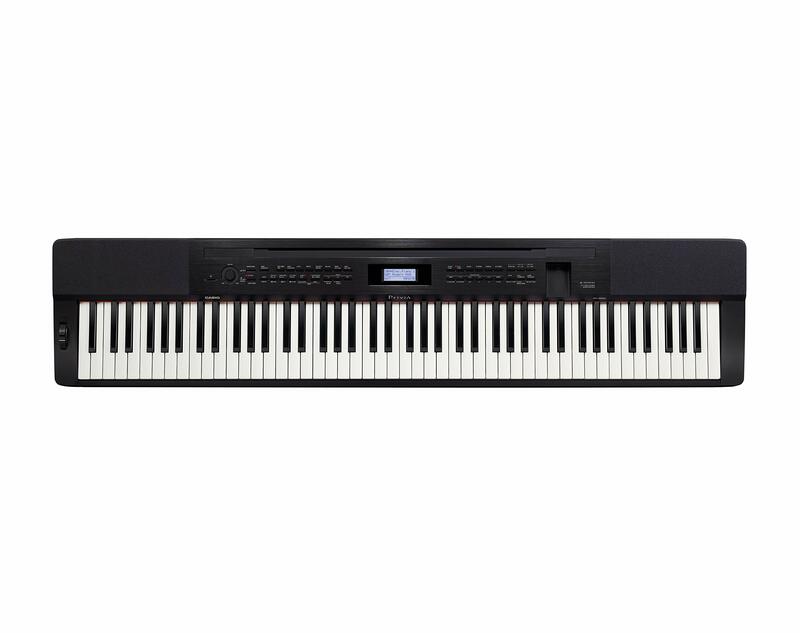 Being the 88-key weighted Action Digital Pianos, the Casio PX760 and Yamaha P115 have the dominant features for players. Out of the box, the Casio PX760 seems to persuade us, thanks to the construction designed with 3 pedals. The P115 only attaches with a single pedal connected by a cord. Next, the P115 has equipped the Pure CF Sound Engine to support the digital piano sound hearing while the PX760 has the innovative Concert-Play function for piano playing. In terms of the sound, both have separate features. The PX760 sets up the sound source: 128-note polyphony, Multi-Dimensional Morphing AiR, and 10 orchestral pieces. Don’t have the same sounds to the PX760. The Yamaha supplements the common sounds to the P115, including different grand piano voices, clavinet, vibes, strings, electric pianos, and etc. To split and layer sounds, the P115 has the support of the built-in speakers, so the amplification system is especially larger than the PX760. 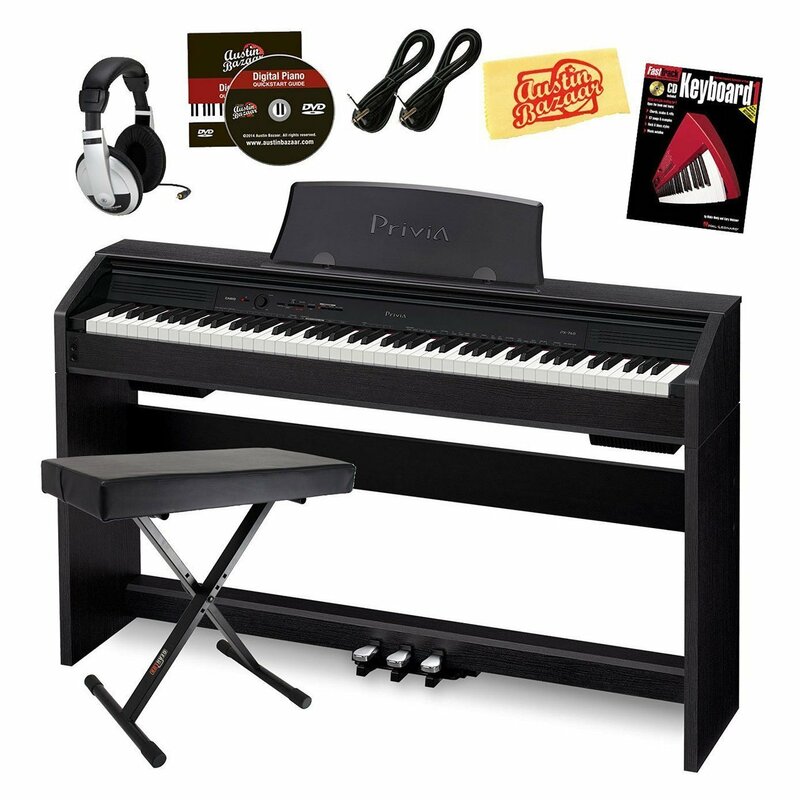 Obviously, either the PX760 or the p115 can meet piano players’ learning need. If compared to the price, both are under $800. The Casio PX760 and PX350 show the clear difference of the style. One is designed as a real piano and another is simply keyboards with a stand. Probably, this leads to a difference in the price of both. The Casio PX760 is much more expensive than PX350. Nevertheless, for the features, both models from Casio are pretty similar. If you do not require too much, the Casio PX350 is appropriate. 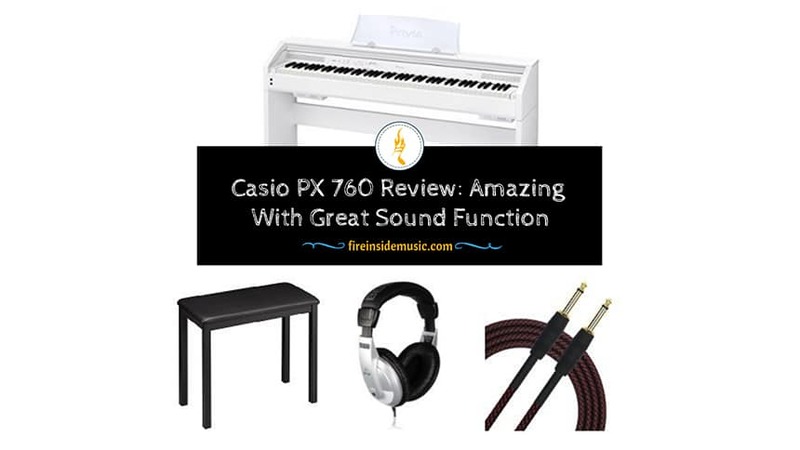 On the contrary, the Casio PX760 spends for those who love the real sound like piano. Are you searching for a piano for your children or yourself to learning how to play the piano? Well, Casio PX760 can be one of the best selection for you. 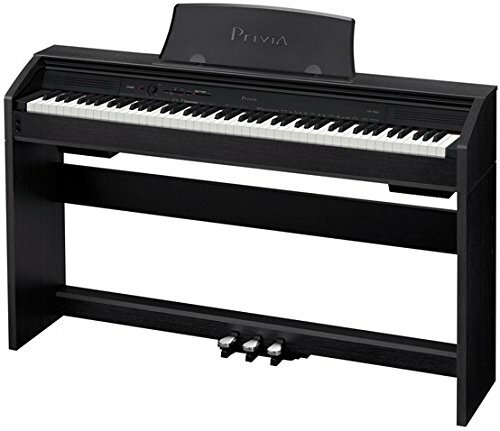 From the built-up construction to the sound quality, the PX760 Privia Digital Piano from Casio makes impression on the consumers. There are the open back, the various sounds for piano, the sensitive keyboard, and more. All listed particularly above. We surely recommend it to the consumers, who are beginners learning piano, are living in a small space, and have the budget under $1000.